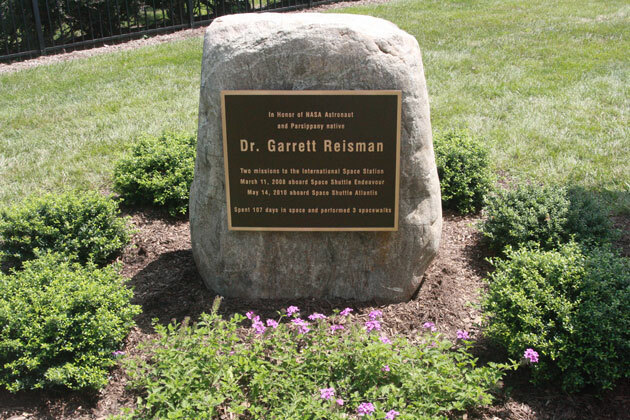 The Township of Parsippany-Troy Hills unveiled a plaque honoring Dr. Garrett Resiman, on Friday, July 18. 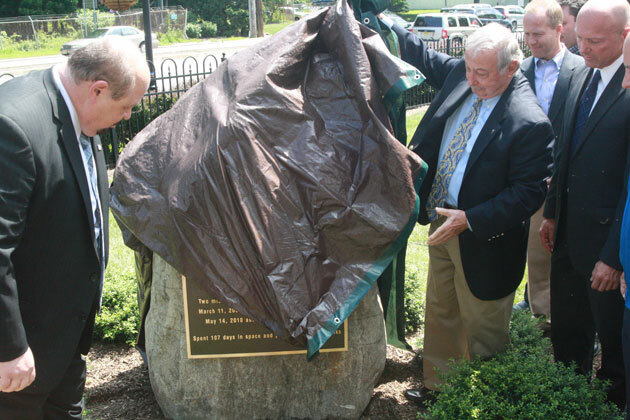 The plaque mounted on a large stone will remain at the Veterans Memorial Park, Route 46. Introduced by Mayor James Barberio and Councilman Michael de Pierro, Reisman thanked two of his former scholastic wrestling coaches, Don Babb and Gary Vittorio, and his high school physics teacher, Gerry Vander Voort. “The remarkable thing was more what it did to me,” he said about the Swedish Fish encounter. “When I’m flying up in space, and floating in front of my eyes, coming out of a dream, is the word Parsippany staring me in the face, it evoked such tremendous feelings of home. And this massive wave of nostalgia hit me. And I thought about a lot of you, and this place. There I am, going 17,500 miles an hour, round and round the earth, and suddenly I was back home in Parsippany. “And so it’s true that you can go very far, and do a lot of things, but your home stays with you. Your home makes you who you are, your home allows you to do the things you do. So thank-you,” he continued. Swedish fish are distributed in the U.S. by Cadbury Adams USA and are most commonly found in specialty candy stores in which they can be bought by the ounce and sold prepackaged in plastic bags. Cadbury is located at 389 Interpace Parkway. He also joked while I had over 100 days in space, I did not get his patch because the first mission was 95 days and it has to be one mission with 100 straight days to get it. Great accomplishment either way. 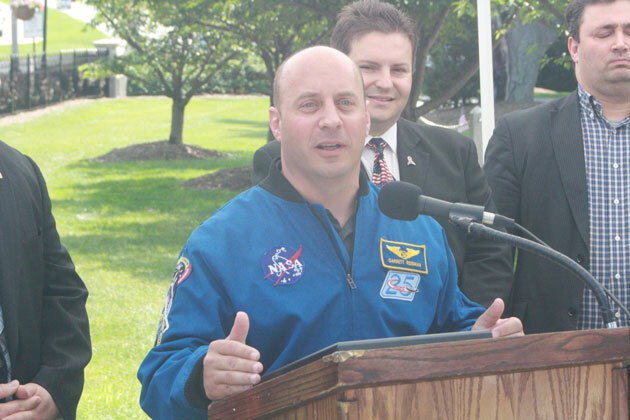 Garrett Erin Reisman (born February 10, 1968) is an American engineer and former NASA astronaut. He was a backup crew member for Expedition 15 and joined Expedition 16 aboard the International Space Station for a short time before becoming a member of Expedition 17. He returned to Earth on June 14, 2008 on board on Space Shuttle Discovery. He was a member of the mission that traveled to the International Space Station aboard Space Shuttle Atlantis from May 14 to 26, 2010. 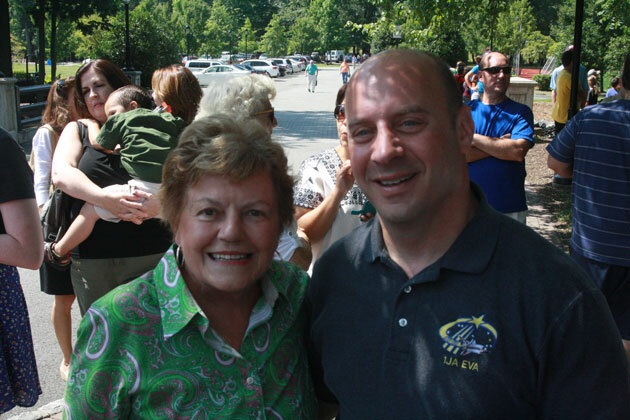 Dr. Garrett Reisman with Barbara Krakowski. Reisman was a childhood classmate of actress Jane Krakowski, Barbara’s daughter. 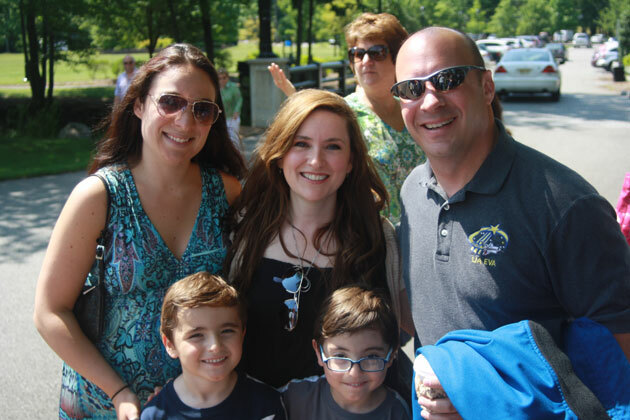 Kelly Murphy with her twins Nicholas and Joseph Cucinella, meets Dr. Garrett Reisman, along with Montville ESL teacher Andrea Corbo-Chaudhary. 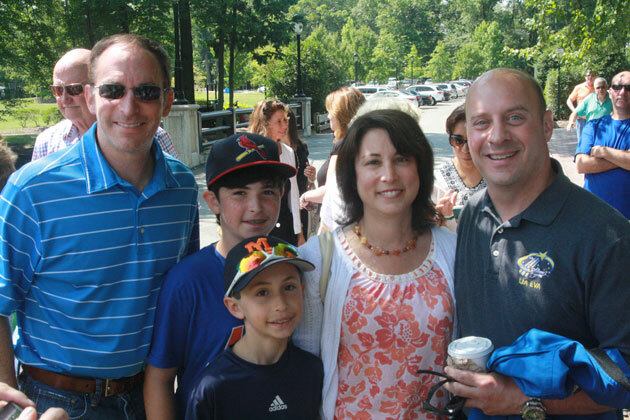 David Span, Alex and Will Span and Debbie (Weisberg) Span with Dr. Garrett Reisman. The Woman’s Club — Karen DeChristopher, Reisman, Lora Rios-McBride, Marilyn Marion and Cathy Cerbo during the unveiling of the plaque honoring Reisman. Dr. Garrett Reisman jokes about Swedish Fish in space. Reisman thanked two of his former scholastic wrestling coaches, Don Babb and Gary Vittorio, and his high school physics teacher, Gerry Vander Voort. Councilman Michael dePierro (right) unveils a plaque honoring Garrett Reisman of Parsippany at Veterans Memorial Park. Dr. Garrett Reisman and Councilman Michael dePierro proudly looks at the new plaque honoring Reisman. Parsippany Mayor James Barberio, Freeholder John Cesaro, Council President Paul Carifi, Councilman Lou Valori (back row), Dr. Garrett Reisman, Councilman Michael dePierro and Council Vice President Robert Peluso (front row). Reisman was born in Morristown and is a 1986 graduate of Parsippany High School, a 1991 graduate of the Jerome Fisher Program in Management and Technology at the University of Pennsylvania, and received his Masters and Doctorate degrees in Mechanical Engineering from the California Institute of Technology in 1992 and 1997, respectively. 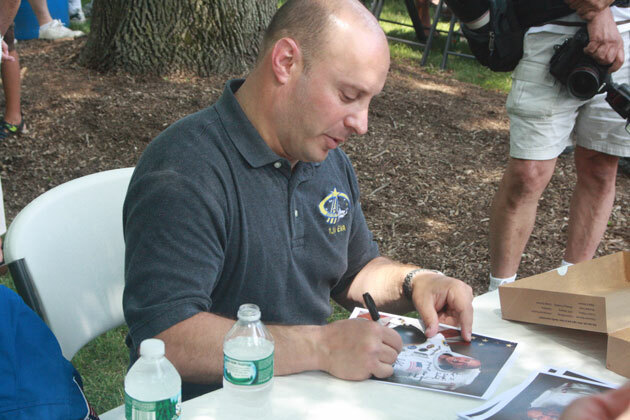 In June 2003, Reisman served as an aquanaut during the NEEMO 5 mission aboard the Aquarius underwater laboratory, living and working under water for fourteen days. 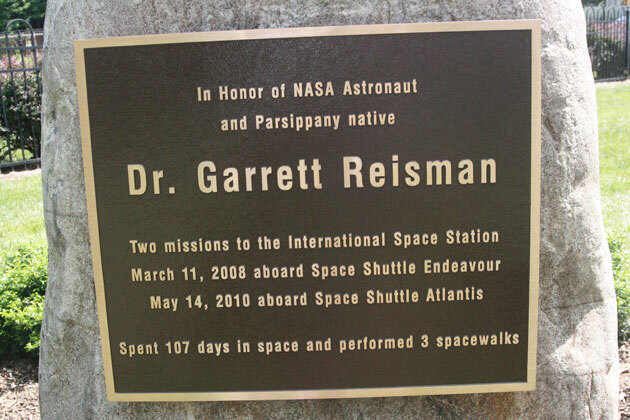 Reisman was assigned as a long duration crew member on the International Space Station. He launched as Mission Specialist 5 aboard the Space Shuttle Endeavour mission on March 11, 2008. After docking he took part in the first spacewalk of the mission. Reisman stayed on board as Flight Engineer 2 for part of Expedition 16 and part of Expedition 17. Having completed his mission, he returned to Earth as Mission Specialist 5 aboard on June 14, 2008. During his time on board the ISS he had seen two visiting Space Shuttles and the installation of the Special Purpose Dexterous Manipulator (SPDM) and the pressurized section of the Japanese Experiment Module “Kibo”. Reisman was the first Jewish crew member on the International Space Station. He sent a greeting from space to the people of Israel during the celebration of Israel’s 60th Independence Day in May 2008. He also did an entertaining, high definition video of “A day in the life of a space station crew member” while on board as well as demonstrating in the large, and at the time empty, Kibo section, that humans cannot “swim” in the microgravity of orbital space. 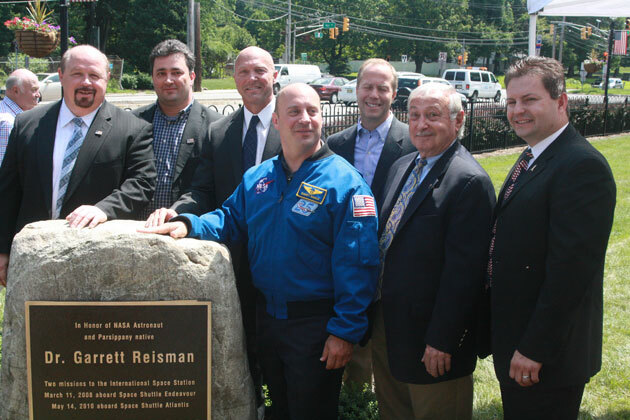 Reisman was a member of the STS-132 mission that traveled to the International Space Station aboard Space Shuttle Atlantis from May 14 to 26, 2010. He participated in two spacewalks during this mission. Reisman was a childhood classmate of actress Jane Krakowski. In May, 2010, Krakowski said on The Tonight Show with Jay Leno that she and Reisman exchanged e-mails while he was in space on Space Shuttle Atlantis. At the request of the crew, many of whom were 30 Rockfans, Krakowski provided an autographed script of the show which was brought into space.